This tour departs from Summit Seawall at 10am. This fun filled adventure is all about getting all guests focused on the sailing experience. Each passenger aboard the J Farwell will be actively involved in the sailing process learning about gybing, tacking, setting the course, turning the winches, and becoming a full crew member! A great option for the whole family. This tour departs from Summit Seawall and is 1.5 hours long. 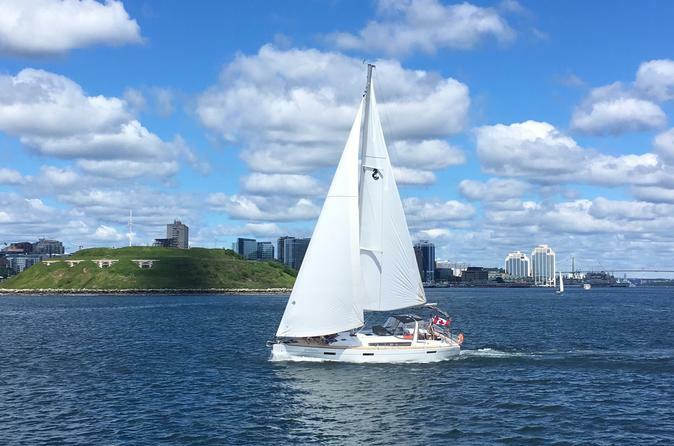 Throughout the tour you will enjoy the beautiful scenery of the Halifax Harbour. Depending on the weather the massive spinnaker will be set. This tour will provide you with an authentic sailing experience. • 10:15am: Passenger interaction and sailing experience. View iconic sights in our Harbour including Georges Island, Halifax waterfront, Dartmouth, and more! There is a full cash bar on board available to any guests over the age of 19. • 11:30am: Dock downtown Halifax near great places to shop, wonderful restaurants, as well as other entertaining tour options!